O'ki Big Shooter chartreuse flasher with yellow mist finish (substitute for flasher in picture which is no longer available). 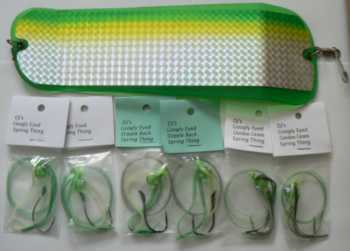 Also included 2 each GS003 Googly Eyed Spring Thing, GS009 Googly Eyed Stipple Back Spring Thing and GS010 Googly Eyed Gordon Green Spring Thing. Please check out our shipping page. More specials to come when our Flasher order arrives.